- California American Bulldog Rescue - ADOPTIONS - Rescue Me! 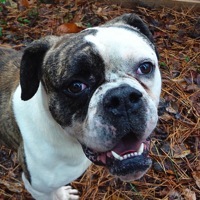 American Bulldogs adopted on Rescue Me! URGENT: Animal could be euthanized soon. Even if you don't like meat, you'll love BRISKETT (#A1834434), a 6-year-old, 85-pounder, who is quite delicious! Meet Happy! Happy is in URGENT need of a longterm foster or forever family. She is as sweet as she is beautiful! Petey is a wonderful sweet boy, incredibly loving. Loves walks, and great with running. He loves kids and adults.. This map shows how many American Bulldogs are posted in other states.